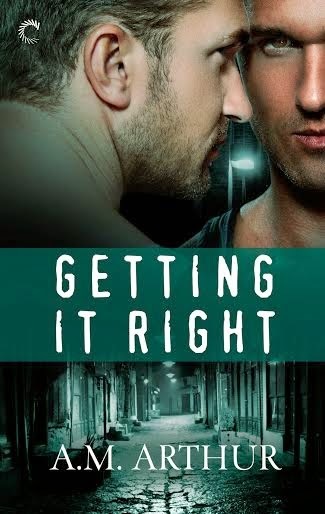 I'm Shelf-ish is happy to be hosting A.M. Arthur and her GETTING IT RIGHT Book Blast today! For a dramatic male/male read, look no further than Getting It Right by A.M. Arthur. This contemporary romance is full of heart-wrenching moments guaranteed to draw you in and leave you wanting more. Detective Nathan Wolf might just be a junior detective, but he tackles every case with the passion that he lacks in his personal life. A series of failed relationships with women has left him still single at thirty-four--because he's too scared to admit to his longtime crush on his best friend James. Dr. James Taggert likes to keep his profession as a psychiatrist separate from his party-animal persona. Known around the gay clubs as Tag, he’s the guy who screws them, leaves them, and never looks back. But James’s drinking is getting heavier, and when bad memories from the past resurface, he’s close to becoming the worst version of himself. After a drunken blackout ends in a hot and heavy make-out session with his very straight best friend, James has no memory of the steamy affair. But Nathan isn't sorry for the kisses that James can't remember. Nathan finally musters the courage to tell James how he really feels, but a life-altering event might force them apart before they can ever be together. Getting It Right is available at Amazon. Order your copy at iTunes. Pick up your copy at All Romance eBooks. Also available directly from Carina Press. He smoked his way through two more cigarettes before Nathan’s beat-up Ram pickup pulled alongside the curb. For a city cop, he was still adorably country. Nathan leaned across the console to shove open the passenger side door, and James gratefully slid inside. The simple, familiar presence of Nathan nearby made James’s nerves unfurl a little bit more. Nathan was the one thing in James’s life that had always made sense. Had always been easy. Weariness settled into his bones, turning his drunken daze into extreme fatigue. He wanted to pass out and soon. Nathan shoved a bottle of water at him, then eased the truck back into the street. He cracked both of the front windows, probably because James reeked of smoke. Nathan had never been shy about telling him how gross his habit was. Nathan was also smart enough not to engage in conversation until they were shuffling up the short sidewalk to Nathan’s half of a two-story duplex. Nathan slung an arm around James’s waist, and the heat of the other man’s body so close felt amazing. Real. Not like the fake closeness of dancing with strangers in a crowded bar. He finally got a good look at his friend as Nathan crossed the narrow living room to the kitchen in the rear. Flannel pajama pants and a spring coat. James had woken him up. Yeah, I’m a douche bag. “You hungry?” Nathan shouted from the kitchen. “No.” In the familiar, somewhat cluttered warmth of Nathan’s home, he had a safe place to wallow in the shame still burning in his gut. Nathan’s place was the definition of a straight bachelor’s pad—which worked since Nathan was a straight bachelor. Dark leather furniture right out of a magazine’s page, decorated exactly the same because he couldn’t be bothered. A monster, sixty-inch flat screen mounted on the wall over an entertainment console boasted two gaming systems, alongside a Blu-ray player and hundreds of movies. Only a handful of photos hung on the wall, mostly of his rather large extended family that lived in southern Delaware. James paused to stare at a familiar photo of himself with Nathan, taken right after Nathan had graduated from the police academy. They were both grinning, arms slung around each other’s shoulder. Nathan so handsome in his uniform, James in a gray suit that hadn’t been stylish in a decade. Because that’s how long it had been. Nathan had made detective last year, so he didn’t wear his uniform anymore. James sort of missed it. Nathan came back into the living room sans coat, a white wifebeater showing off his muscled arms and flat stomach. He was one-eighth Nanticoke Indian on his mother’s side, which gave his skin a lovely golden hue. His short hair was shiny black, and was always soft on the rare occasion James had a reason to touch it. His dark brown eyes often seemed to be smiling at him, even when things were serious, like right now. He was carrying a bamboo tray loaded down with two shot glasses, a bottle of Kentucky bourbon and a bag of barbecue potato chips. He settled the tray on his magazine-covered coffee table, then poured them each a shot. James sank onto the couch next to Nathan and accepted the glass. After a silent toast, he threw it back. The harsh, smoky liquid burned its way into his stomach. No stranger to the writing world, A.M. Arthur has been creating stories in her head since she was a child and scribbling them down nearly as long. She credits an early fascination with male friendships and "bromance" (and "The Young Riders") with her later discovery of and subsequent affair with m/m romance stories. When not writing, she can be found in her kitchen, pretending she's an amateur chef and trying to not poison herself or others with her cuisine experiments. Connect with A.M. on Facebook and Twitter.